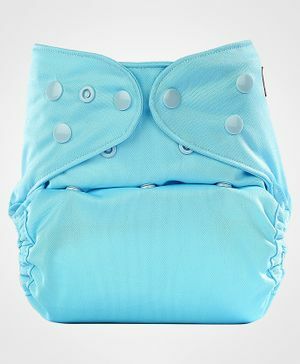 The Bumberry sleeper diaper cover is a one-piece, one -size diaper that works perfectly for night-time. In fact, this product is recommended exclusively for the night and not the day. The diapering involves just a single step. The sleeper has two partially stitched wet free inserts on either side of the diaper which helps adjust absorbency and saves time. The overlapping wet free inserts are made of 2 layers of microfiber each and an additional wet-free fabric that keeps the baby's bum dry. There's an additional pocket to cater to the needs of heavy wetters. We recommend using a fully prepped Bumberry Hemp insert inside the pocket for longer diapering hours and a fully rested, wet free happy baby in the morning. A convenient diapering option made exclusively for overnight usage. The outer PUL is waterproof and it has a stay dry interior to keep the baby dry and comfortable. Snap buttons for comfort fit. Partially stitched wet free inserts to help adjust absorbency. Pockets are provided and a hemp insert can be used for additional absorbency. We follow the AAP (American Academy of Pediatrics) guidelines to limit 6 hours as diapering time. Bumberry is a brand for mothers who care for generations to come. At Bumberry, they facilitate the most environmentally friendly and baby friendly products and services for the world. Their commitment is expressed through their products and services. Their expertise is in innovation in baby friendly products for mother who cares for tomorrow.